Light wakes me in the morning. I toss on my green garden dress, pad to the kitchen to brew tea then step outside to release the chickens from their coop. With clucking and ruffling of feathers, they bounce out into the sunshine. Teacup in hand, I wander. The garden is a little ahead this year, and I am a little behind. 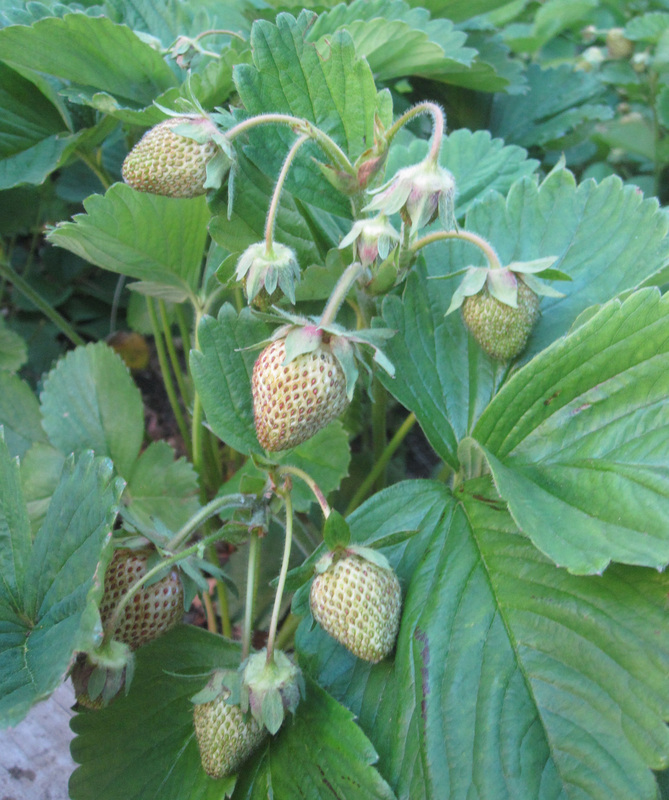 Strawberries are starting to get ripe, and the cucumbers have germinated without having to be replanted. A garden can be a thing of wonder. Wild roses arch over my head and fill the air with a pink powdery scent. I remember digging the bushes from a dry rocky place by the Cle Elum River a few years ago and planting the twisted roots in an equally dry place by my driveway. Now they thrive, and I view them with a critical eye. Some judicious pruning is in order to coax them to behave here in town. Same with the snowberries I transplanted. This garden has been cobbled together over the years with plants from here and there. Some have flourished and others have struggled. I move things around, create structure and allow the plants to soften it. This is the ninth season for this garden, and it is still a work in progress. What I like are the connections–the clump of trilliums came from Gramma’s house where Gramma no longer dwells. The peonies are from my old home in Yakima. The red columbine came from Katie; the mock orange started as a twig from Todd and Christie’s and now is a lovely shrub. They moved back to Montana years ago. The catmint started in 4″ pots from the nursery and now forms mounds of purple, loved by bees all summer. I’ve seen Henry stroll up to a clump, sniff and nibble–only the finest fresh organic catmint for him. I’ve dug up seedlings to share, and now Pam’s cat Norman has his own catmint patch. There are many plants to share–I am continually amazed by what this small plot of ground produces. It’s abundance. Connection. Simple joy. Deb, I like how your garden connects you with others. I’ve certainly thought about how gifts connect us with others and hadn’t extended that idea to plants. (I’m not much of a gardener at this point in my life.) It makes sense, of course. A gift doesn’t have to come wrapped in decorative paper with a bow. Marilyn, I think the best gardens are made with something old, something new, something borrowed and something blue. Gardeners are generous folk, like artists. And I wonder if you have received an envelope from Washington, with a bit of something for your garden?